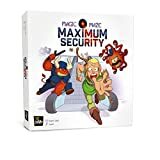 After being stripped of all their possessions, a mage, a barbarian, an elf, and a dwarf are forced to go rob the local Magic Maze shopping mall for all the necessary equipment they need for their next adventure. They agree to pull off their heists simultaneously, then dash to the exits in order to evade the guards who eyed their arrival suspiciously. In order to make this game accessible to people with altered color perception, each color is associated with a symbol. Whenever a color is mentioned, it can be identified by the corresponding symbol. 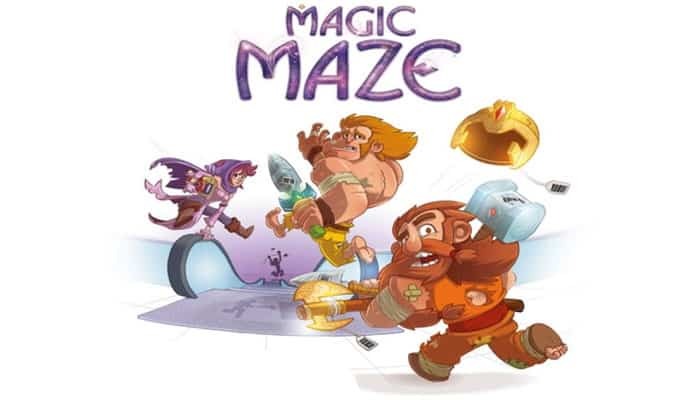 Magic Maze is a real-time, co-operative game. Each player can control any of the 4 Hero pawns whenever he wants in order to make that hero perform a very specific action, to which other players do not have access: move north, explore a new area, ride an escalator… all of this requires rigorous co-operation between the players in order to succeed at moving the heroes wisely, and complete your mission before the sand timer runs out. Moreover, you will only be allowed to communicate for short periods during the game. The rest of the time, you must play without giving any visual or audio cues to each other. All of the players win the game if all of the Hero pawns succeed in leaving the shopping mall in the limited time allotted for the game, each having stolen an item. You have 3 minutes at the start of the game. Sand Timer spaces you encounter along the way will give you more time. If the sand timer ever completely runs out before the Hero pawns escape, all of the players lose the game: your loitering has aroused suspicion, and the mall security guards nab you! 1 sheet of stickers to stick on the Hero pawns (if you wish) which allows people with altered colour perception to recognise them. The two stickers are not used until Scenario 3. 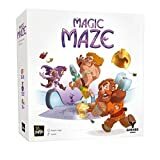 Follow the instructions for the scenario you choose to play, which will tell you how to set up the Mall tile deck 1, usually face down; start with Scenarios 1 - 7 (initiation campaign), then continue with Scenarios 8 - 17. After that, feel free to come up with your own scenarios! Place the starting tile (Tile 1) 2 in the middle of the table (A-side-up if you are new to the game; otherwise, however you like), and randomly place the 4 Hero pawns on the 4 central spaces 3. Set aside the Theft tile 4 (A-side-up) as well as the Out of Order tokens 5. Take the Action tiles corresponding to the number of players (number in the lower-right corner) and give one to each player 6. Place your Action card in front of you so everyone can see it, with its North arrow pointing in the same direction 7 as the one on the starting tile. Make sure the Action tiles stay in the same direction as the starting tile throughout the entire game! You can chat, plot, and scheme as much as you want during the setup, but as soon as the sand timer is turned over, you have begun your heist, and silence and subtlety are required: you cannot communicate in any way whatsoever! Tip: Are there too many of you to fit around your table? Not everyone can reach the pawns? No worries! Get rid of the chairs and play standing up! When everyone is supposed to pass their Action tile to the left (see page 7, Scenario 3), everyone can simply step to the left instead. Explore the shopping mall, partially or completely. Move each Hero pawn onto the Item space of that hero's colour. When all four Hero pawns are simultaneously on their respective Item spaces, they steal the items, the alarm is triggered, and the four Hero pawns must quickly reach the exit without being caught (i.e. without the sand timer running out). At this moment, flip the Theft tile B-side-up. When a Hero pawn reaches an Exit space he can use, remove that Hero pawn from the board. Once all four Hero pawns have left the board, you have achieved victory! However, if the sand timer runs out at any moment during the game, you have met defeat! During the game, you can perform the action(s) depicted on your own Action tile at any time, and as often as you wish; however, you cannot perform any actions that are not on your Action tile. In this game, there are no "turns": you act whenever you notice that one of your actions may be useful. You are never allowed to stop another player's movement: that player must decide when it is the appropriate time to stop. 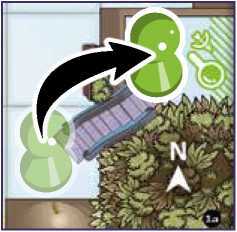 The Move action allows you to move a Hero pawn as many spaces as you want in the direction indicated by the arrow. The Hero pawn's movement must end before it hits an obstacle (wall, another hero, etc).. There can never be two Hero pawns on the same space. Brian, who has the NORTH arrow, moves the hero 2 spaces north. Alice, who has the WEST arrow, moves the hero 2 spaces west. Finally, Marc, who has the SOUTH arrow, moves the hero 1 space south, onto the orange Exploration space. Note: With 5 players or more, several players will have access to the sameMove action. The player with the Use a Vortex action (and only this player) can move any Hero pawn from wherever it is to any Vortex space of its colour. This is a very quick way to travel long distances. Important: Once the theft has occurred, the Vortex system will be automatically shut down; this means that the Use a Vortex action cannot be used during your escape! The player with the Take the Escalator action (and only this player) can move a Hero pawn from one side of an escalator to the other, no matter which way the escalator is oriented. A Hero pawn can never stop on an escalator. 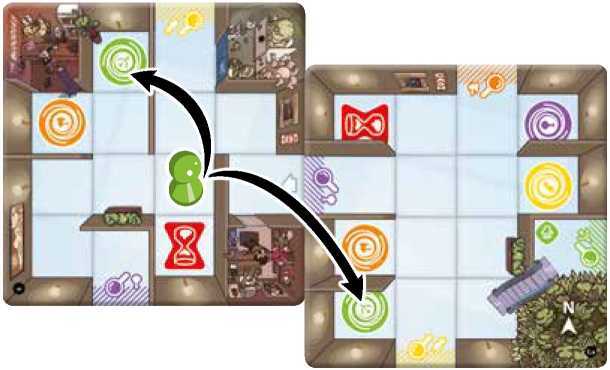 The player with the Explore action has the responsibility of adding new tiles to the board. He/She can only do this when a Hero pawn is standing on an Exploration space of its own colour that leads to an unexplored area. The four types of Exploration spaces. 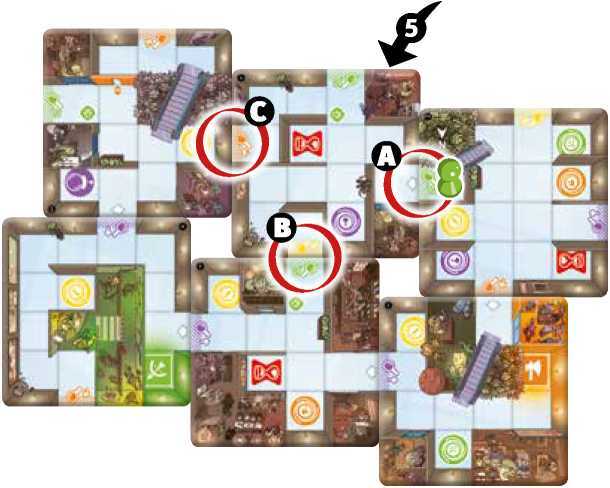 Once a Hero pawn is on an Exploration space of its colour, the player with the Explore action reveals the top tile from the deck, and places it so the white arrow continues from the Exploration space used. Once a passage has been explored, any Hero pawn can move through it, in either direction, regardless of their colour. After placing a new tile 5 at A, one of its Exploration spaces may be connected to an Exploration space of a tile that was already in place B. The passage created that way is valid, and can be used by all the Hero pawns, in both directions. Following the placement of a new tile, it is also possible that one of its Exploration spaces connects to a wall of an existing tile C. Of course, it is a dead end. Note: the layout of the Exploration spaces and white arrows makes it impossible for two Mall tiles to overlap. The theft occurs automatically when all four Hero pawns are simultaneously standing on the Object spaces corresponding to their respective colours (i.e. yellow on yellow, etc)..
To visually signal that the theft has occurred, flip the Theft tile B-side-up. Now you have to escape to the exit... without the help of the Vortex system, which has been deactivated (flip the Action tile with the Use a Vortex action on it)! If the sand timer runs out, you have lost the game! But each time a Hero pawn is moved onto an available Sand Timer space, you must immediately flip the sand timer, regardless of whether that gets you more or less time. Important: do not use a regular timer instead of a sand timer; the result is not the same! The Hero pawn can be moved onto the Sand Timer space to flip the sand timer. Each Sand Timer space can only be used once, after which you must place an Out of Order token on it, beneath the Hero pawn standing on it. For your information, there are four Sand Timer spaces in the shopping mall. Staring intensely at another player. Taking the "Do Something!" pawn and placing it in front of a player to tell this player that it is time to, well, do something! But this player might not agree, and may immediately place the pawn in front of another player. Each time the sand timer is flipped over, the players are allowed to speak for as long as they wish while the sand continues to flow. No actions can be performed during this discussion time. As soon as any player performs any action, all communication must cease again! Notes: If a player has just completed a regrettable action, but did not break the rules of the game (for example, he has moved a Hero pawn too far north), only the player with the appropriate action can fix this error (the player with the South arrow in this example). If you notice that a player has infringed upon the rules of the game, you are allowed to point this out verbally. Return the game components to the situation before the mistake was made, but the timer is running the whole time; you do not get back the lost time of the mistake, the explanation, or the fix, so fix it quickly! 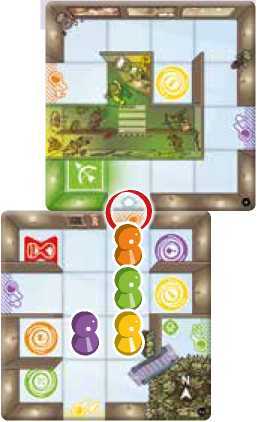 The setup of the tiles is identical to the multiplayer version. 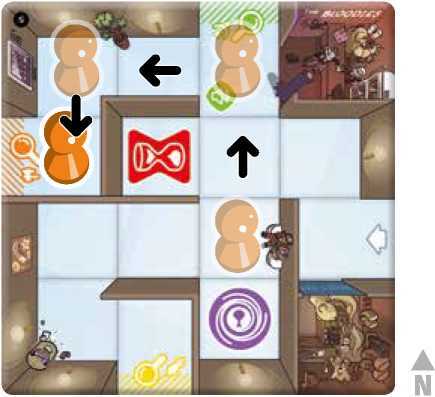 Take the 7 Action tiles for 1-player games (number in the lower-right corner), make sure their North arrow is pointing in the same direction as the arrow on the starting tile, shuffle them, and place them as a face-down deck. Once you flip the sand timer, the game begins. Using only one hand, you must reveal the Action tiles one by one onto a discard pile until the action you wish to use is visible on top of the discard pile. You can then use that one action with any number of the Hero pawns, and as many times as you wish. You cannot hold the deck in your hand! To perform another action, you must continue to reveal and discard the other Action tiles from the deck until the action you want comes up. If you empty the deck, flip the discard pile face down (without shuffling it) and start revealing tiles again, one by one, looking for the action you want. Whenever you flip the sand timer, you must shuffle the deck and discard pile together to form a new deck.